For the Intel Xeon D-1500 series launch, STH was first to have pre-production Xeon D-1540 benchmarks. We limited the benchmarks published because we did not have sufficient time to get the system setup and work through test regressions like we normally do. Also, we knew our pre-production Xeon D-1540 ran at 1.9GHz base and 2.4GHz all core turbo, 100MHz lower than production versions. We also had only one platform to test on. All told, we had relatively low levels of trust in those numbers which is why we did not publish a full set of benchmarks during the launch week. Fast forward two weeks, and we have both the Supermicro X10SDV-F pre-production unit as well as the Intel Beverly Cove microserver node available for testing. While the power figures are quite different between the platforms, we now have consistent CPU performance benchmarks we are comfortable with, albeit at about a 5% disadvantage to the retail parts. For the Intel Xeon D-1540 pre production units we had units on hand from Supermciro and Intel. 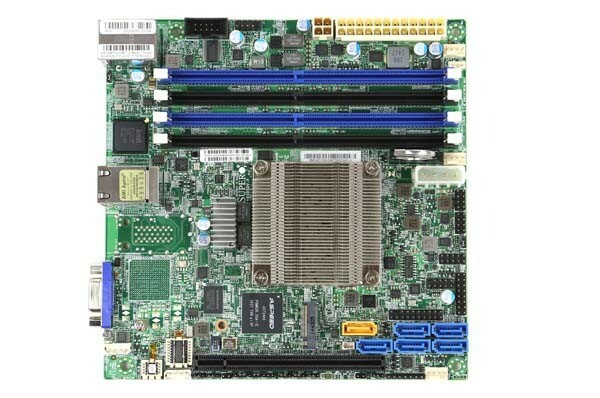 The Supermicro X10SDV-F is a mITX motherboard with only 1GbE networking exposed. We did install 64GB of DDR4 RDIMMs and ran benchmarks from RAM as is the STH standard. Our Intel platform consisted of a Beverly Cove microserver node which was in a special engineering setup. One can see that the node is similar to the high-density microserver nodes we see today with a SoC, RAM and storage and the expectation that networking will get routed through the chassis backplane. This setup also had 64GB of RAM. It did not, however, have an onboard BMC so we utilized a Lantronix Spider to remotely monitor the tests. For the comparison group we enlisted several datapoints. First we picked a dual Intel Xeon L5520 system with 48GB of RAM running in Dell C6100 chassis to show 2009 era high density performance. Next, we picked an E5-1620 V3 which is a Haswell-E generation LGA2011-3 Xeon. 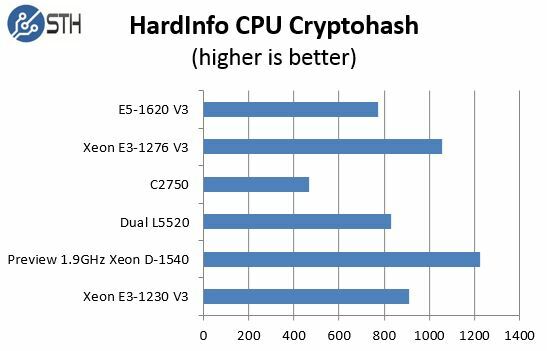 Perhaps in the closest competition we picked two Haswell generation Xeon E3 chips, the E3-1230 V3 and E3-1276 V3 to give some data points in terms of one of the higher performance options previously in this space. The Intel Atom C2750 was also added just to show the previous attempt at a SoC circa 2013. Note, the C2750 has become the benchmark system for ARM competition to try beating in 2015. The Xeon D is going to have a major impact on that plan. 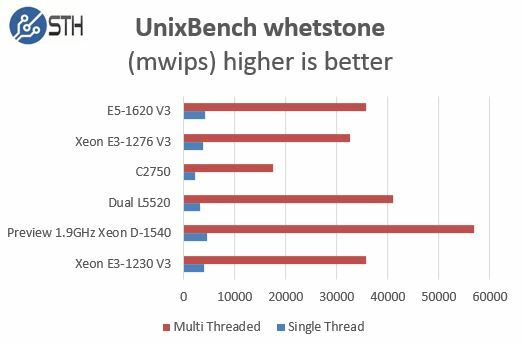 We utilized our standard Linux-Bench test script for these benchmarks. The great thing about Linux-Bench is that one can compare it to other sites (e.g. Anandtech and Tom’s Hardware) that use the script or even just pop in a Ubuntu LiveCD, run 3 commands and compare the results below to your own system. 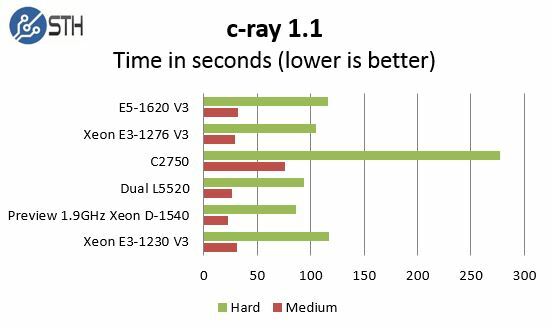 The first benchmark we are looking at today is c-ray 1.1 which is a highly threaded benchmark that will favor additional cores and Hyper-Threading. Here we can see that the two fastest systems were both 8 core/ 16 thread processors (dual L5520 and Xeon D). While the Intel Xeon D is showing off here, do remember that the production version will have a 5% advantage over what we are seeing in our current systems. The other big takeaway here is to just look at the SoC performance gap between the C2750 and the D-1540 and note that this is not a simple generational improvement. Moving on to Sysbench, another popular Linux CPU benchmark we can see an unexpected result. Overall the lesson here is that 8 threads only gets you so far. The C2750 falters significantly on single threaded performance which we expect. On the other hand, the dual L5520 system performs extremely well (almost too good) but consistently. We are beginning to think there may be some optimizations that are running on the older processor and not being used for Xeon D, which would make sense since except for large clients (and apparently us) not many people have Xeon D to test on yet. 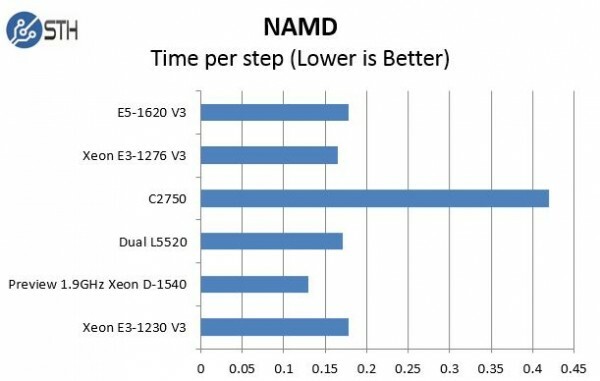 NAMD is another benchmark where we see complete dominance of the Atom C2750 by the Xeon D-1540. NAMD is a fairly complex benchmark, so the Silvermont architecture’s lower cache and floating point capabilities are likely hurting it in the benchmark by a good margin. For the inverse we are looking at the HardInfo CPU cryptohash benchmark. We had a similar result. The Atom C2750 fell behind, but was using about 32w total, lower than any single chip TDP of its competition. The pattern of the E5-1620 V3, E3-1230 V3 and the E5-1276 V3 being fairly similar in terms of performance is supported. 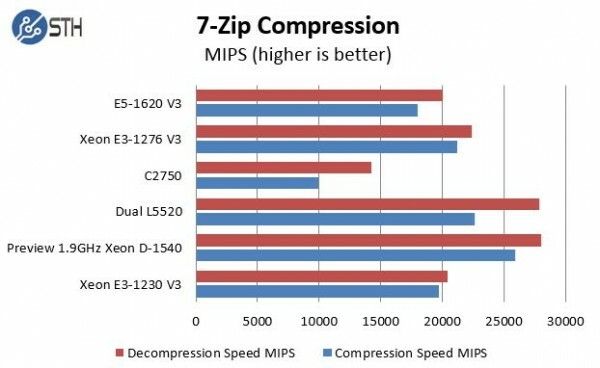 On our compression tests, we used 7-zip compress / decompress to test CPU speed. Here we can see that the architectural enhancements of the Broadwell-DE part are paying off. 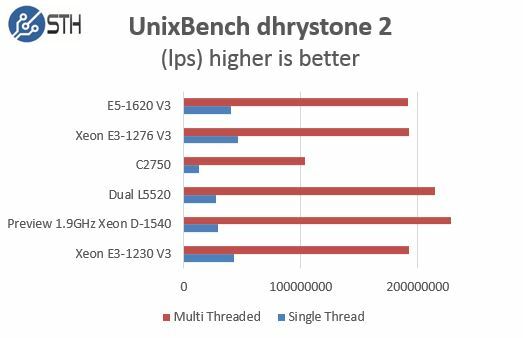 As we move to UnixBench we look at the results across our dhrystone 2 and whetstone tests. 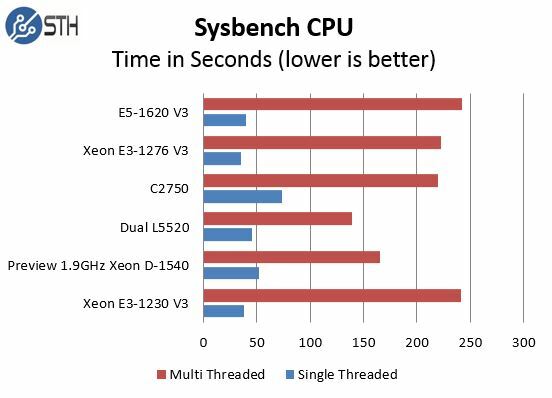 Here one can clearly see that the Xeon D-1540 has strong performance in both single and multi-threaded tests. As we move to floating point performance, the Broadwell-DE architecture performs extremely well. Having 8 cores and the newest microarchitecture of the group helps. There are a few surprises in our benchmark results but the bottom line is that technology advances and Broadwell-DE is the next generation. As the remainder of the Xeon lineup gets updated to Broadwell over the next year or so, we will expect other platforms to creep higher in terms of performance. We are still investigating the power consumption piece of the equation. Our two test systems produce performance numbers very close to one another. Power wise the results are not consistent enough to publish which may be the norm for pre-production parts. More to come on that front. Hely f— it’s powerfull! Going to put this in my next off site backup NAS. Very nice perf. I want buy but can not find any online. Seems like Broadwell is a significant jump in performance. At 1.9GHz it is outperforming E3s that can do 3.6GHz. Impressive! 45w is very good for what it delivers, especially considering (I believe) that since it is a SOC this figure includes the Ethernet, etc chips right? If anyone makes a board like this in ATX or ATX-E with more expansion (I’m thinking, three 8x slots and two 4x slots (all with 8x plastic) I might just come knocking. I could replace my dual socket 2x 60w system with this and not even need any NIC’s! Would the D-1520 be about half the performance of the D-1540 on these benchmarks? Really good stuff. 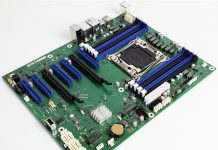 Can’t wait for the SuperMicro board to be in production. Hopefully it will not be too expensive in Sweden. If the wallet can handle it, I will definitely build a 3-node ESXi cluster. Being a home lab enthusiast the form factor is great. I am so glad they choose to ditch some of the useless I/O ports in favor of RAM-slots and LAN-ports. This is great when space is limited. Which it usually is when having a small datacenter at home. I’d get two of these, one 1520 for ZFS storage, and one 1540 for ESXi. I would guess slightly over half, as the clocks are higher on the 1520 than one the 1540.